Latest Information: The AIIMS Rishikesh has successfully given the Staff Nurse Grade 2 Exam on 28th October 2017. The candidates who have appeared in this recruitment exam they will be able to check their result in a short span of time. Introduction: All India Institute of Medical Sciences, Rishikesh (Uttarakhand) has successfully organized the AIIMS Staff Nurse Grade II Exam 2017 on 28th October 2017. This exam was the Computer Based Test i.e. the mode of examination was online. A huge number of job hunters have participated in this examination because they wanted to get this job. Now, such candidates are waiting for the result. They can check all the latest updates on the AIIMS Rishikesh Staff Nurse Grade 2 Result 2017 with the help of this page. Topics Highlighted on this Page: AIIMS Rishikesh Staff Nurse Grade II Result 2017. 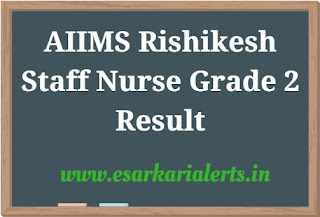 AIIMS Rishikesh Staff Nurse Result 2017 and AIIMS Rishikesh Staff Nurse Grade 2 Cut Off Marks 2017. About Exam: The complete process for this examination is being directed by the All India Institute of Medical Sciences (AIIMS) Rishikesh. This examination is a recruitment exam which is being conducted for total 1154 vacancies of Staff Nurse Grade II (Nursing Sister) in this department. The CBT Exam was successfully carried out at various examination centers. A huge number of applicants were seen in this exam and recently, they all are in the search of the result. 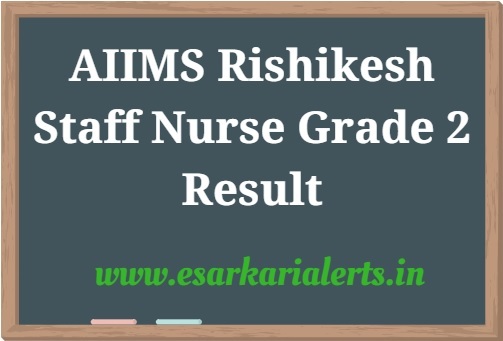 The organization has also mentioned the AIIMS Rishikesh Staff Nurse Grade II Qualifying Marks in the official examination notification. These marks will be very important in the selection of candidates for the next round. So, candidates can check the cut off from the following table. 5% relaxation in qualifying marks in each category. Selection Process: Candidates, who will qualify this examination, will have to participate in the Skill Examinations at AIIMS Rishikesh. These rounds will be of the qualifying nature. All the Best to All Candidates for their Results!!! Stay Visiting http://www.esarkarialerts.in for the latest Jobs, Admit Card, Result, Answer Key etc.